(Apologies for the terrible picture, I should have waited for the steam to dissipate. And set the whole thing up a bit better). I knew when we bought the brisket that there would be lots leftover so I planned to turn the rest into tacos or wraps with the addition of some chilli sauce and some black beans. That chilli sauce is brilliant at turning leftovers into something exciting but it does pay to use a variety of dried chillies so that you can layer up the flavours. I get these at Borough Market but there are various online stockists that carry them too. As it turned out, Stephen was out this evening though so I just had the beef and beans without the bread, cheese, guacamole, sour cream, etc. The beef was certainly much more enjoyable eaten this way but the beans were the real star. I cooked them in the oven using a no-soak method I read about on eGullet. I don’t generally soak my beans anymore anyway but I haven’t tried cooking them in the oven before. Cover the beans in water, add salt (since I knew I was going to be turning these into a variation of refried beans, I also added chilli, garlic and onion) and bring to the boil on the hob. Put a lid on the pot and then transfer to a pre-heated oven (at 150 degrees) and cook for 75 minutes. Ours took a little longer than this and we did need to top up the water with boilng water from the kettle but otherwise, the method worked out really well. We had the oven on anyway and the resulting beans were tender and evenly cooked, something that can be difficult for us to achieve on the hob since our gas feed runs high and keeping an even temperature with a diffuser plate isn’t that easy. I’ll definitely be using this method again. 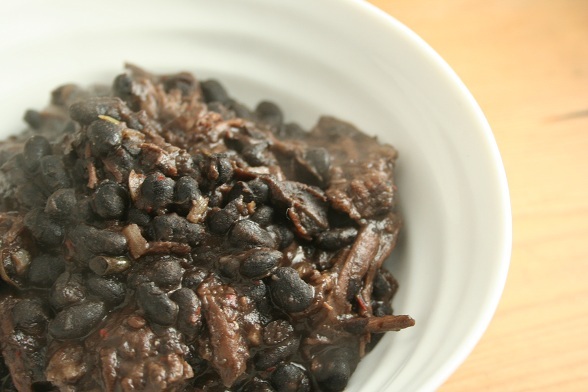 Subscribe to comments with RSS	or TrackBack to 'Leftover Beef Brisket with Black Beans'.